Two forehands beats one. That’s the philosophy behind ambidextrous tennis. This means eliminating the backhand, and hitting with a right-handed AND left-handed forehand– depending on the situation. Nothing in the game of tennis has as much revolutionary potential as this style. Firstly, why take up ambidextrous tennis? For me it was a right elbow injury that caused me to put down the racket. Like most athletes, I couldn’t sit still, so I decided to try the racket in my left hand. I quickly discovered that I had more power on my left side than my right! That really got me thinking… and now here we are. 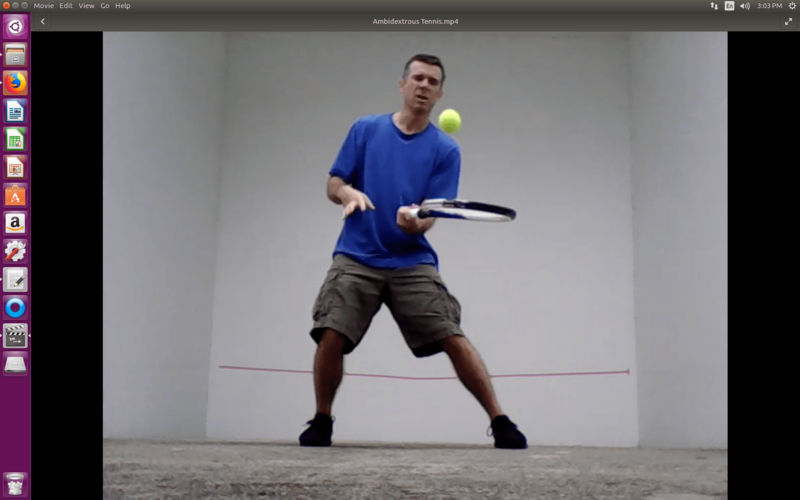 In this video below I demonstrate the basics (& a few nuances) of ambidextrous tennis. The advantages to hitting this way are multi-fold. Ambidextrous tennis provides: 1) More power & higher spin rates; 2) Better court coverage with less effort; 3) Better attack angles while closing off windows-of-vulnerability. 4) Numerous openings to close in on the net, and finish. I predict (in the future) that ambidextrous tennis will outlast everything else, and become the dominant style among top professionals. The advantages of this style are too apparent, and eventually some ambitious young boy (or girl) is going to master these concepts and win a lot of tennis majors. Why? Because two forehands beats one. Does this mean that I can now beat Roger Federer? Of course, not. I’m too old, and don’t have his ability. What the ambidextrous style will do is raise the level of anyone’s game, just by becoming more aware of the other half of one’s body. As a footnote: I wouldn’t even want to imagine Roger Federer with two forehands [! ], he’s good enough already. The point is, few of us have anywhere close to Roger Federer’s ability. Imitating his style can help to an extent, but you aren’t going to get better than him by copying him. He’s the best. If young tennis players want to consistently break through Federer-Nadal and the rest on the men’s side (and Serena Williams on the women’s side), then they are going to have to be extraordinarily talented– and still think outside-the-box. The top players are the best for a reason, because they have the talent & dedication, and it takes a lot to get past them. Ambidextrous tennis (when mastered) gives anyone the tools they need to attack & defend against the best players. Most tennis player’s are taught to attack an opponent’s backhand. In ambidextrous tennis there is no backhand, thus most opponent’s strategy is foiled before they even step onto the court. This is a frustrating style to match up against, and many people I’ve hit with, have disappeared over the years. People generally like to hit against people they can beat, so many of your ‘tennis friends’ will bail on you, once you get good at this style. Final tips: It’s what your body is doing during pronation that counts in tennis. If you don’t pronate, while maintaining vision & balance– then you’ve got nothing. Consider the racket as a sword, and the tennis ball as a bullet. You are always protecting your head & body while being ready to move in any direction, for any required shot. Ambidextrous tennis allows quick & efficient movements, combined with controlled power. Light feet skate. Keep everything in-line– from eyes to toes. Stay low and get lower as you approach the net. Stay down until the point is over. Ambidextrous tennis conserves energy, which makes all this easier. The best reason for playing (and mastering) ambidextrous tennis, is that you will have no weaknesses. Wednesday 2-28-18— P.S on endorsements: I’m going on the record in saying, I would love to have a shoe deal. I would obviously need a manufacturer as a partner. Today, most athletic footwear sold in stores, is junk. It only enriches the corporate manufacturers, and the handful of celebrity athletes endorsing their signature series. Poor materials, bad design, and shoddy construction are major issues with athletic shoes– especially considering their price tag. Since most shoes are sports specific, and already have top-athlete spokesmen/women, I would propose to design a shoe that works for serious amateur athletes. That’s a big demographic, hungry for innovation. Tennis is a good model, because you can wear any kind of footwear you choose, as opposed to other sports, which have restrictions on style & design of the shoes. If I wasn’t blacklisted, I would surely have been contacted by now, after posting “Ambidextrous Tennis.” This only proves (once again) that there is now no room for outside-the-box re-thinking, anywhere in the capitalist market. Censorship bites everybody. I’ve made a few changes to my featured routine since I’ve posted this piece. I now practice barefoot, because you finish with your feet. I also don’t serve off the wall and chase for the return anymore. I now hit into the corner and let the ball bounce back in my direction. Remember this is a racquetball court being used for tennis training. The bounce will typically hit off two walls, reducing the pace and allowing you time to move your feet. You don’t know which wall it will hit off of, because you are aiming at the corner. When you hit dead into the corner, it bounces back with crazy spin or knuckleball effect. This really improves footwork & focus on the ball. 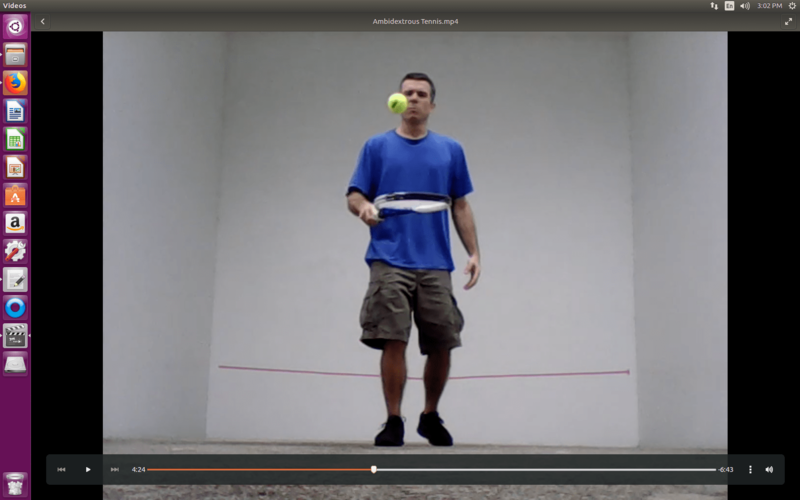 Do this right-handed & left-handed, as shown in the video, and you will get better at tennis. This entry was posted in Film & Mass Media, RS Content, Sports and tagged Instructional Video, Short Film by admin. Bookmark the permalink.